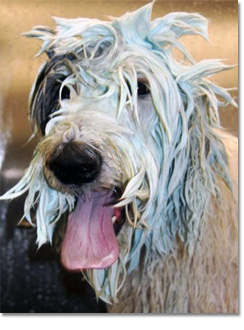 10 reasons why your dogs hair cut costs more than yours! 1. You don’t go for weeks and never wash or brush your hair. 2. Your hair dresser doesn’t have to carry you back and forth kicking and screaming to the sink. 3. Your hair dresser doesn’t wash and clean your rear end and give you a sanitary trim. 4. Your hair dresser doesn’t clean your ears. 5. Your hair dresser doesn’t have to remove the boogies from your eyes. 6. You sit still You don’t bite or scratch your hair dresser. 7. Your hair cut doesn’t include a manicure and pedicure. 8. Your hair dresser only washes and cuts the hair on your head. 9. You don’t decide to do an operatic solo at the top of your lungs and encourage all other patrons to join in. 10. The likely hood of you peeing or pooping while your hair is being cut is slim. Please call for prices on bath only dogs. Prices vary depending on weight, length of hair and breed. If your breed is not listed or if you have a mixed breed consider the closest match to be an accurate estimate. Estimated prices are on dogs that are groomed on a regular basis which is every 4-6 weeks. We don’t make appointments for nail trimming only, unless another dog is being groomed at the same appointment. The charge for nail trimming is $10.00. There is a $25.00 fee if 24 hour notice is not given to cancel a grooming appointment or if no one is home during your scheduled appointment time. Copyright © 2019 Top Dog Pet Services. All Rights Reserved.